Russia had always seen itself as primarily a land-based empire, so at the outbreak of war in 1941 the size of the Navy and Air Force was very small compared to the vast Red Army, and both were considered mainly as support services for the latter. The Red Navy soon found many ships bottled up in port by the Germans, and for most of the war it confined itself to coastal duties such as convoy protection and support for land operations. This left a still sizeable pool of sailors with at least a basic infantry training and relatively little to do, and with the huge losses suffered by the Red Army it was no surprise that many sailors found themselves serving as land infantry. Although some served in the defence of Moscow they usually operated close to their main bases - at Leningrad (where they distinguished themselves during the siege) and particularly in the Crimea, where several amphibious assaults were undertaken. The usual dress of sailors when used as naval infantry was a short pea jacket (bushlat) and trousers tucked into boots, while retaining their sailor’s cap (bezkoziyrka). However this is not the uniform that Pegasus have chosen for these figures. 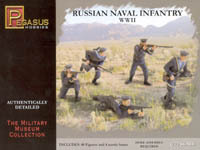 In order to make them more recognisable as naval infantry these figures are wearing their ordinary shipboard uniform with the pullover (Flanelevka) that includes the square rig collar common to sailors in most navies. Certainly this uniform was sometimes worn while on land but it was not the most common, and therefore in our view not a good choice. However, the chosen uniform is correctly done apart from the fact that the over-shirt is in all cases worn outside the trousers, when in fact it should have been tucked into them. All the photos of this uniform always show this was done, so to have them untucked here is an error which is difficult to remedy. Many photographs of these men show them wearing crossed ammunition belts as bandoliers, regardless of the weapon they held. This was another 'badge' for these men, so it is a pity that so few figures in this set have such a thing. All seem to have ammunition pouches, yet there is doubt as to whether these were widely issued to navy personnel. The officer is entirely correctly done, with jacket and peaked cap. He has no shoulder boards, which were banned by the Soviet authorities until 1943. While there are issues over some aspects of the accuracy there are none over the sculpting. These relatively simple uniforms are nicely done with all the right creases and folds, and items such as weapon detail and faces are outstanding. Many of the figures come in several parts, typically a man with his right arm and weapon as a separate piece. Most of the figures are made in a standard 'soft' plastic, while the weapons and extras are done in a hard plastic to maximise the level of detail, and this works very well. The parts go together pretty well and flash is virtually no-existent, while the separate parts mean there is no unwanted plastic, even in the usual areas such as around the chin of the firing poses. The poses are uniformly excellent, with a very natural stance to every one. As can be seen there are many prone figures, which is entirely suitable for World War II and also suggests the beach-landing role. Some may seem odd, like the third man in the fourth row, who appears to be firing into the ground, or the third man in the third row, who does not 'stand' as he appears above. This is because these are meant to be placed on the terrain bases included (those strange blobs in the bottom row). When done so they look great (see here, although the dark plastic makes it difficult to see). The separate parts are designed for specific figures rather than to allow a lot of mix-and-match (although Pegasus point out that you can mix-and-match with their German infantry sets), but there are a few spare arms, including one holding a bomb (to make a man for the mortar). However this only works for the running poses, which does not create a particularly good crewman. Shortages were legion, particularly early in the war, so many naval infantrymen went into battle wearing part or all of the clothing of an ordinary soldier. However unit pride meant they avoided this if possible, and in particular they tried to retain the cap. While these are not typical of their subject they are lovely figures to look at, with little details like the trailing tally (ribbon) on the cap looking superb. Yet this set falls well short of depicting its subject in all its forms and we can only hope that another, perhaps more useful set of figures showing a more usual appearance will one day appear.